This new Mr. Pink started out with a mash of barley and wheat malts, oat flakes, orange peel, and hibiscus. For fermentation, we used Burlington yeast, a strain commonly used for New England IPAs because of its high content of fruity esters, which help provide the desired haziness and “roundness”. Perle hops, a variety that we use in most of our Mr. Pink variations, provide the beer with its distinct light bitterness. We were extremely pleased with last month’s strawberry version of Mr. Pink, so we decided to work with Belma hops once again as they provide some bright berry aromas. The beer was dry-hopped with a substantial addition of Willamette hops, giving the beer some lasting floral aromas. 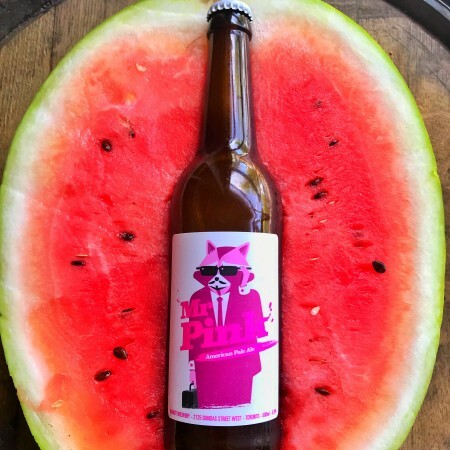 The addition of pureed watermelon was the very last step in the brewing of this beer, in order to keep the watermelon flavour and aroma as big as possible. The new version of Mr. Pink is available now in the Bandit taproom and bottle shop while supplies last.